Some day, I hope to write a book on the deeper side of intercultural marriage, but I still feel like I don’t really know enough to even know where to begin. Hence my search for deeper understanding of the complex beauty of intercultural relationships. I’ve read lots of books on intercultural marriage, but just came across one that’s the most helpful I’ve seen so far. 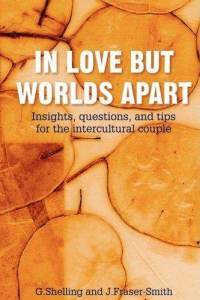 In love but worlds apart: insights, questions, and tips for the intercultural couple, written by Grete Shelling and Janet Fraser-Smith. Both are in intercultural marriages of sorts and have years of working with other couples in intercultural marriages. The book is written in a half-teaching/half-workbook style, with commentary, explanations, and examples followed by lists and lists of questions for intercultural couples to discuss. It pretty much skips over the typical ‘cultural fascination’ dimensions (the visible layer of the iceberg concept of culture) and gets straight to the heart of intercultural relationship by helping the reader examine if they can truly live out the rest of their life in an intimate relationship with someone from another culture. – How can you find “the one”? – How would I know if he or she is the right one? -What do we imagine about one another’s cultures? – How do we show that we like or love each other? – What do we really want from our partner? – What if our situation changes? – Will our parents support this relationship? From there, it discusses how intercultural couples sort out where to live, how to forge a new cultural identity as a couple, how to determine working values to guide your relationship (regarding, money, family, gender roles, children, etc. ), and finally, how to develop healthy interpersonal skills in light of cultural differences. Each of these chapters has a similar list of questions to those listed above. As my husband and I have recently been reflecting on the joys and challenges being in an intercultural relationship, we continue to see the value of awareness and honesty as a means of growth and acceptance. In love but worlds apart provides a framework by which to explore how to do this. While it’s written in a tone toward an unmarried couple, I’d just as easily recommend it to those already married. My husband and I will certainly be chewing on some of the questions for quite a while. How does this book (or for that matter the collective of books you’ve read) compare and contrast to the strategies laid out in the Bible? For example, when scripture instructs us to NOT conform to the world, but rather be called out of it and transformed by the renewing of our minds into the likeness of Christ, thereby better able to set the example for and change the world, we are essentially choosing to leave our worldly lifestyles and choosing God’s lifestyle instead. While this may have little impact on cultural details such as meal menus, clothing choices, music preferences, etc. because God doesn’t care whether you choose curry or catfish, it does have important implications for the high-level aspects such as your relationship to finances, what to do with ailing in-laws, the definition of infidelity, etc. It seems to me that the wisdom of being equally yoked, and as my favorite teacher puts it, “letting the Bible be your referee, there is little need to argue because the Bible settles it. Whatever the Bible says, both parties do. The end”, would be a comforting and unifying path to follow. The closer each of you gets to Christ, the closer you inherently are to each other. Like airplanes–are you aiming for the same airport? If so, you’re going to get closer to each other. If you’re aiming for different airports, your paths may cross but ultimately they’ll diverge. Speaking of airports, after reading several of your posts, I get the sense you often feel you have a foot on two continents, trying to live both ways simultaneously, without having a well-defined meeting place in the middle that you can agree on as your new, combined lifestyle. I should think living two lifestyles at once would be more exhausting than either singularly. Having myself rejected a great portion of my own culture to live God’s way, I can honestly say there is little I feel I’m missing out on and a great bounty I’ve discovered I’ve gained. But I would have found the transition significantly easier if I knew what I was transitioning to. A choice isn’t fully a choice if it’s A or nothing, as compared to choosing A or B (or in the inter-cultural sense, C). A spouse doing similarly would also wonder more about the new destination than what was left behind. Humans naturally resist change when the alternative is the unknown. Do too many inter-racial couples set out on a journey with no clearly defined destination? Could it be that neither spouse has fully committed to leaving enough, or all, behind, and that is what is holding them back? Is there a point where one has to decide whether he or she is married moreso to a culture than their spouse? If so, where is that line in the sand? Might inter-racial couples fare better if they leave their own knowns behind to meet each other in a new, specified known? If they spent their early years together in a neutral third location/culture, thereby enforcing their sameness to each other as different from everyone else? A manner of self-examination that is “safer” because each of you does it compared to the neutral situation, rather than against each other? How can spouses effectively play on the same team if the team and the rules haven’t been defined–or worse, they’re trying to play for both teams as the same time? Just being aware of cultural diferences in a relationship, the presence of that dynamics, understanding where the other is coming from, I think is a loving way to honor your spouse and relate to him. To love him and understand what he is trying to say so I can respond appropriately or serve him well as my partner in life I think is self-sacrificing. I think God would want me to love well and offer many graces to him. And I would pray he would do the same for me. I am always looking for good books about bi-cultural marriages. My French husband and I have been married for over 20 years now and I think we are still learning about each other. I was recently asked by a friend what advice I would give as she contemplates marrying a person of another culture. I was not sure how to reply to that since I think we more less took it one day at a time. I will recommend this book to her. Thank! This is awesome review! I too hope to write a book about intercultural marriage with a focus on interfaith. But just like you, I’m reading a lot of intercultural books that are to help me earn more about this. I haven’t seen this book yet. I’m sure I’ll find this. Thanks for sharing.